Two firsts in one lesson. We got some really nice work tonight. We had such a fun ride tonight. Going into my lesson, I mentioned to Christy that I wanted to work on “forward” first, because it’s dang hard to connect a horse that isn’t moving. Once I had warmed Derby up and trotted a few laps, we cantered a few times – just a lap or so, because neither of us have an excess of fuel in the tank. However, Derby still wasn’t in front of my leg, so Christy had us work on some exercises to get us there. 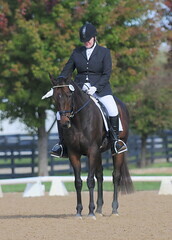 First, on a circle, she had me do trot-walk transitions, only walking two strides before picking up the trot again. Initially, the transitions were mushy – indistinct and not prompt. Christy had me remedy this by *requiring* a crisp, “trot NOW” transition. Derby replied enthusiastically on our next attempt, stepping straight into a canter. Not the prettiest moment in equitation, but I like how he's stepping up underneath himself. 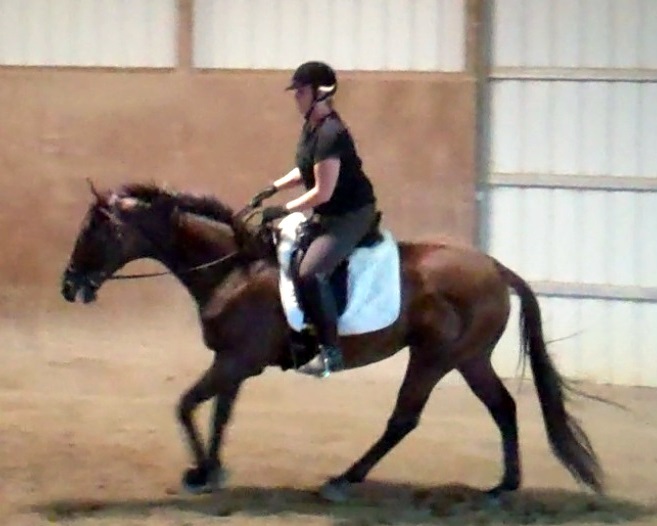 Okay, so our first walk-canter transition was an accident, but it felt awesome. I allowed Derby to roll for a minute, because an enthusiastic forward response is a very good answer. The last thing I needed to do at that moment was to jerk him in the mouth and punish him. From there, quickly tallied our second “first” of the evening. Christy had us do trot-canter-trot-canter transitions, with just a few strides of each gait – and Derby responded with alacrity. And after that, the overall quality of our work improved. Best of all, we were able to get the transitions both ways. I still need to work myself into balance going right, but I’m able to get there, and able to generate good work that direction. 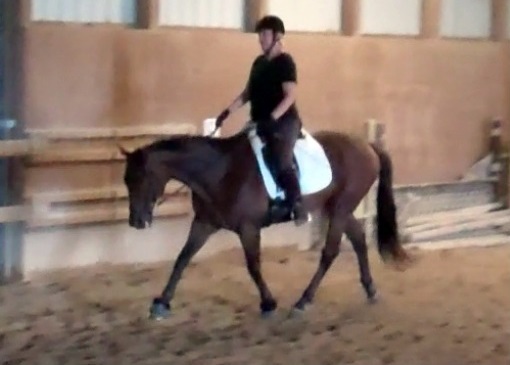 To wind the ride down and let the horse stretch (he’s been stuck in his stall for the last two days due to torrential rain and thunderstorms) we just trotted some laps – but I was asking for a big, reachy trot and also asking Derby to work over his back. Building top line is still a top priority, and this is a good way to do it. I was happy with his responsiveness and overall, it was a fantastic ride. We need to keep him in front of my leg but we really are making progress. He’s a good boy! 2 Responses to Two firsts in one lesson. I like those exercises–I’ll have to try them out soon. ❤ Christy from afar.